Lawsuit ... Why is Clive jailed again ? Not the Oregon thing - but the old Nevada standoff ! And this is in the lefty Guardian .. Jailed Nevada rancher Cliven Bundy filed a lawsuit against Barack Obama, challenging his placement in solitary confinement and seeking to dismiss the federal governmentâ€™s felony charges that could condemn him to die behind bars. The suit from the rancher, who led a high-profile standoff against the government in 2014, also names US judge Gloria Navarro and Nevada senator Harry Reid. The complaint, filed Tuesday, offers a defense of the 70 year oldâ€™s infamous comment that black people may have been â€œbetter off as slaves, picking cottonâ€� and slams Obama for â€œdespicable disrespectful mockingâ€� of Bundy at the 2014 White House Correspondentsâ€™ Dinner. 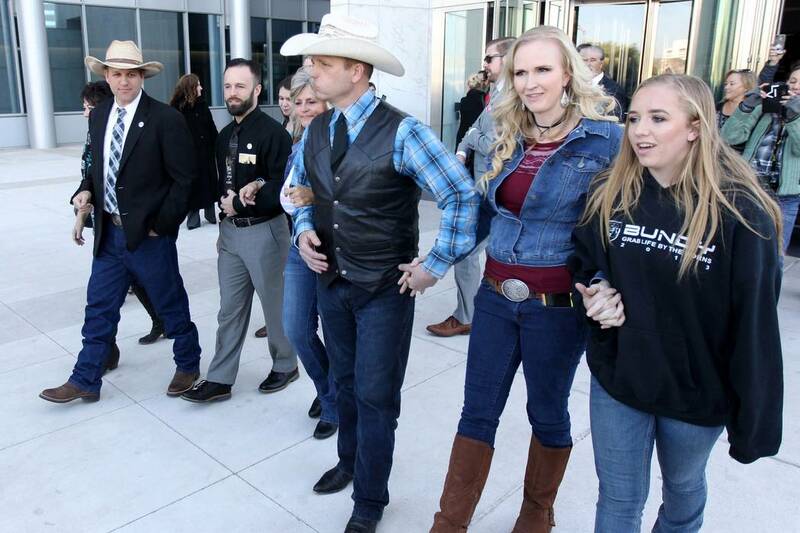 The lawsuit comes as Bundy faces numerous federal charges stemming from the April 2014 showdown at his property when authorities tried unsuccessfully to seize his cattle and faced off with hundreds of supporters, some heavily armed, who defended the familyâ€™s ranch in Bunkerville, about 80 miles north-east of Las Vegas. Bundy, along with four of his sons and a dozen activists, now faces charges of conspiring against the US, assaulting and threatening law enforcement, using firearms to commit violence, and interference with interstate commerce by extortion. The lawsuit from Bundy â€“ who has been denied bail and remains incarcerated as he awaits trial, is scheduled for February 2017 and accuses the government of â€œcruel and unusual punishmentâ€� for locking him in solitary confinement. It also says officials have violated his free-speech rights, his freedom of religion, his second amendment rights and his right to a speedy trial. The suit calls for Navarro to be removed as the judge in the Bundy case, noting that Reid recommended her for an appointment and Obama nominated her â€“ and both Reid and Obama have publicly made negative comments about Bundy. Reid has called Bundyâ€™s supporters â€œdomestic terroristsâ€� and recently said he wanted to push for a national conservation area by the familyâ€™s ranch, now that the Bundy men are incarcerated. Obama briefly alluded to Bundy in his 2014 speech, saying, â€œLet me tell you something I know about the Negroâ€� â€“ a reference to Bundyâ€™s controversial remarks on race. Spokespeople for Reed, Navarro and Obama did not immediately respond to requests for comment. Were the feds there to steal the uranium? Late Thursday I filed a lawsuit against Attorney General Jeff Sessions and FBI Director Christopher Wray in their official capacities, the Department of Justiceâ€™s (DOJ) Office of Professional Responsibility (OPR) and the Inspector General (IG) over their failure to conduct an investigation into the bad faith and gross prosecutorial abuse by federal prosecutors and the destruction and hiding of material exculpatory evidence by the DOJ, FBI and Bureau of Land Management (BLM) in the ongoing criminal prosecution of Cliven Bundy and his sons Ryan and Ammon. The case was filed in the U.S. District Court for the District of Columbia (Case No. 1:17-cv-02429). Today, I will be filing a motion to have the case heard on an emergency basis. You can go to www.clivenbundydefensefund.org for updates. The complaint details how the the U.S. attorney for the District of Nevada â€“ Obama Deep State holdovers who should have been removed by now by Attorney General Jeff Sessions â€“ working in concert with the FBI and BLM under the Obama administration, systematically violated the constitutional rights of Cliven Bundy and the other defendants in the criminal prosecution, denying them due process, equal protection and other rights under the Constitution and the law in general. Elmer Fudd (Jeff Session) needs a wake up call, but I sure he isn't fazed by anything, if he isn't deep state he is a loony tune. Justice will be served when these prosecutors are arrest and put in prison! Put a little crimp in their railroad kangaroo court to punish Cliven Bundy hmmm? How about all that lousy time in jail? Does he have recourse? Yahoo! Chief U.S. District Court Judge Gloria Navarro! Interesting! At one point Bundy wanted her removed from case. She refused! Maybe having gone through this it kept Judge Navarro honest! â€œA mistrial in this case is the most suitable and only remedy available,â€� U.S. District Judge Gloria Navarro said. Cliven Bundy was not released Wednesday, but his attorney said his next goal is to make sure that the mistrial is declared â€œwith prejudice,â€� which would prevent the government from bringing the case a second time. Navarro has scheduled a hearing for Jan. 8.
â€œThere has been flagrant misconduct, substantial prejudice and no lesser remedy is sufficient,â€� she said. The charges were dismissed â€œwith prejudice,â€� which means the federal government will not be able to retry the men. The same judge declared a mistrial in the case late last month, citing prosecutorial misconduct. when justice comes, does it come slowly ? What we are seeing is justice catching up with the globalists and their minions! This is just the beginning of their fall! THE GLOBALISTS AND THEIR COWARDLY MINIONS ARE SO DONE! JUSTICE WILL BE SERVED ON EVERY ONE OF THEM WHEREVER THEY LURK IN THEIR SLIMY DENS! The Real Reason they Dismissed the Bundy Case! REAL AMERICANS WIN WHEN THEY STAND UP TO REAL INJUSTICE! HAGE IS PROOF!